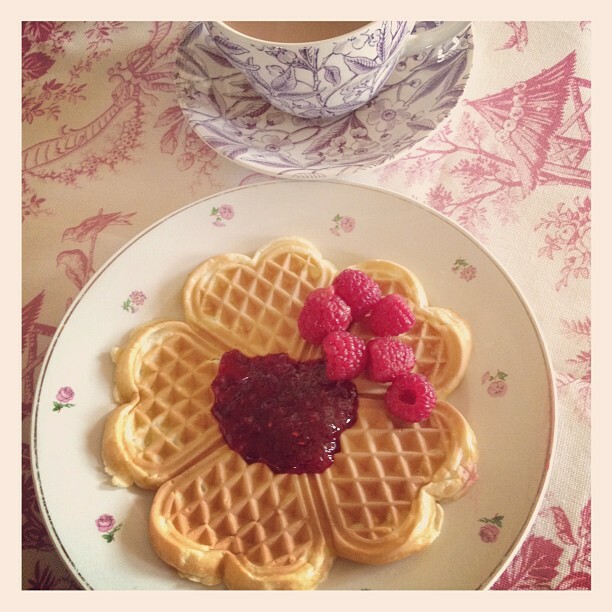 You will need a waffle iron – I’ve got a classic heart-shaped one that’s been working so well for years. Every week-end and Wednesdays (children don’t have school on Wednesdays in France), I make waffles. We all look forward to this ritual with such enthusiasm, it’s always so much fun to be together at the breakfast table and indulge. Served with nutella, jam and berries we are one big happy family. Here’s my little French touch – I love to add a dash of ‘Fleur d’oranger’ (orange blossom water). The smell and taste remind me of my grand-mother’s Madeleine cakes I loved so much. Mix the flour, baking powder and sugar in a large bowl. Slowly pour in the milk, adding the eggs one by one. Pour in the butter, stirring constantly, and finish off with a dash of orange blossom water. Mix well, the batter should be easy to stir but not too liquid. Your dough is now ready for the waffle iron. One small ladle of batter is usually enough to cover the waffle iron, depending on the size. Cook 2 minutes or so (your machine usually has its own timer. Serve with jam, nutella, icing sugar and if you wish. when do you put in the melted butter? ?